On Saturday 27th October, Rotarian Mark Davis took his bus on what was to be a 400 km round trip, picking up his first 3 passengers at 8.30am in Lakelands. 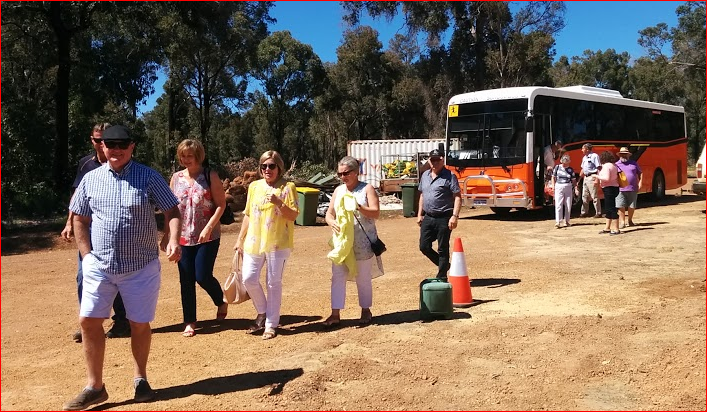 A further couple of travellers joined in South Yunderup, before 8 more in Pinjarra, another small group from Blythwood, and the final 4 joined the bus at Coolup. While Mark expressly banned the singing of "The wheels of the bus go round and round", the passengers were all in a cheery mood as he drove his passengers to Drakesbrook Winery. Nestled between the rolling hills of the Darling Scarp, with views across the plains to the Peel inlet in Mandurah, the stunning Drakesbrook vineyard property is located less than 2 hours from Perth. The drive took us over the Waroona Dam, and by the side of Lake Naverino, a popular skiing and fishing location, some dairy farms, and National parkland – all just a short drive from the town of Waroona. On arrival, the group were met by the winery owner Bernie Worthington, who introduced them to the very wide range of wines made at Drakesbrook Winery. The group were able to taste white wines such as chardonnay and semillon, and reds such as malbec, shiraz, and merlot. Judging by the sales that followed, it is fair to say that the wines where appreciated by all. During his talk, Bernie spoke of the difficult times the winery has faced over the past three years. As well as the property being devestated by the 2016 Yarloop bushfire event, (devestation that the winery is still recovering from), smoke damage from prescribed natural forest burning to the growing fruit had occurred at critical times during the grape growing season. In spite of the setbacks, the winery has continued to produce many award-winning wines. Bernie expressed his gratitude to the work of such groups as Rotary who assisted during the immediate aftermath of the 2016 bushfire event, and since. In response, Pinjarra Club Past-President Willie Brown recalled the awful scene as he and other Rotarians came into the area immediately following the fire to begin the process of determining an appropriate Rotary relief response. Willie thanked Bernie on behalf of the visitors for his hopitality and the opportunity to have learned about Drakesbrook Winery, and wished him well for the future. On a parting note, Bernie requested that the best way that people could assist all the local wine producers is to request local district wines whenever they visit restaurants and cafes in the Peel District. 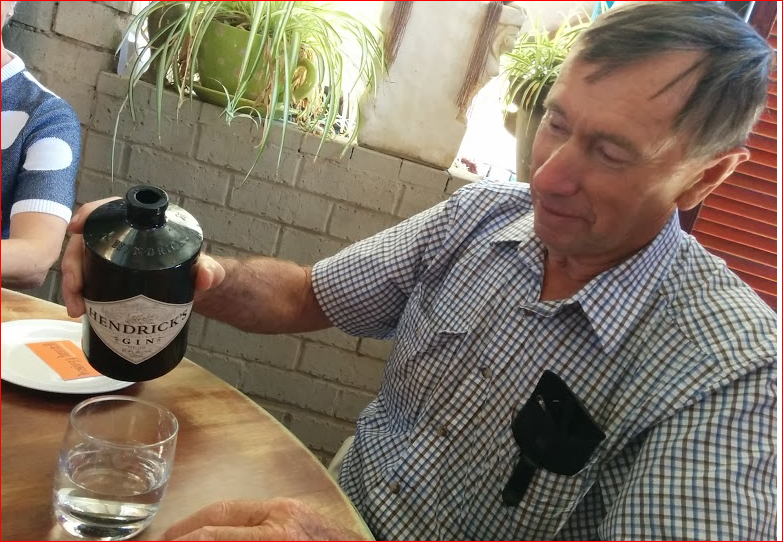 He believes that only five Mandurah establishments at present offer the local wines. Clearly, this is not ideal for the local producers. Leaving Drakesbrook Winery, Mark drove us back to Waroona (deftly avoiding the 1.5 metre dugite on the road...there were cries of did you see that?? ), to our lunch venue- The Hairy Lentil Restaurant. It is a unique quasi vegetarian eatery with a pleasant, comfortable rustic dining arrangement. The travellers enjoyed dishes such as Beef & Mushroom Pie (Tender Harvey Beef slow cooked with mushrooms in a rich demi glaze),Pumpkin & Feta Tart (Roasted pumpkin, feta and grilled capsicum), Curried Vegetable & Vegetable Strudel (Indian curry spiced chicken & vegetables wrapped in a light puff pastry), and Roast Pumpkin Salad (Roasted pumpkin & beetroot tossed with salad greens, walnuts, feta). There were certainly no complaints as everyone dined well. Although the following photograph may indicate that Past-President Willie found something else to sample!! After lunch, we headed south to the Ha-Ve Cheese Factory located at Wokulup, just south of the town of Harvey. It is a family owned and operated, specialising in making cheese to time-honoured methods using only the freshest, creamiest locally sourced milk. Harvey Cheese is delicious due to its clean, fresh creamy flavour, soft, moist texture and low salt content. One of their slogans is "Drop in and taste for yourself...you won't be disappointed". Again, there were cheeses purchased. In addition, the shop area had many arts and crafts on display...and a gelateria!! The consensus was that the gelato was awesome, and there was not much conversation amongst these tourists while enjoying their ice creams!! Well, as the well known advertisement says, "Wait!! There's more!!" 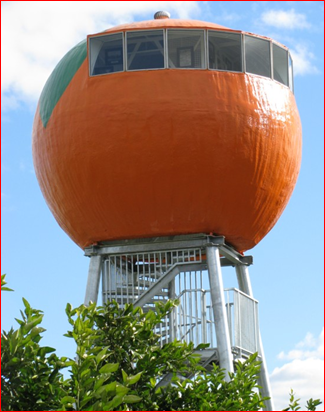 Mark now drove to the site of the tourist site of interest,"The Big Orange", located a little north of Harvey. Oh, it is also the location of the Harvey River Estate Winery. The winery operates a 40 acre vineyard in Harvey, along with sourcing the best fruit from a select group of small growers, producing well known premium varieties including Cabernet Sauvignon, Shiraz, Sauvignon Blanc, Semillon, Merlot, Chardonnay and Rosé. Like many Europeans, Giuseppe Sorgiovanni (Joe) travelled from his small village of Caulonia in Calabria Italy in 1928 to start a new life in Western Australia. Joe settled on a small farm on Third Street, Harvey, where he toiled the fertile soil of the Harvey River flat lands known as a prime horticulture region. His large plantation of orange trees led to the development of Harvey Fresh, a local producer of fruit juices and dairy products. (And the reason for The Big Orange). In November 1999, inspired by Giuseppe’s love of wine and with the enormous growth of viticulture in the region, Giuseppe’s son Kevin Sorgiovanni developed Harvey River Estate, ready for the first 2000 vintage. The travellers once again were dilligent in their tasting, and with thanks to President Geoff Booth, learned that (apparently), there is more to tasting the wine than simply enjoying the taste. The cellar door sales were once again indicative of the very positive opinion of the wines sampled. The travellers all flowed back to the bus as they now headed back to their various drop-off places. Before leaving Harvey River Estate, President Geoff thanked Rotarian Bruce Greene for organising the day's outing, and particularly, our driver Rotarian Mark Davis for his excellent driving. On the way home, Mark drove through the town of Yarloop which had been severely damaged in the 2016 Bushfire event. While there was still much evidence of the damage caused by the fire, it was pleasing to see that homes where being re-built and that there was "life in the town still". While it was a long day for the passengers, there was no doubt that everyone had enjoyed the outing. Mark managed to deliver all his passengers safely to their drop-off points, and hopefully arrived home to enjoy a nice cold beer (or two) after what would have been a very long day.